The Battle of Culloden has gone down in history as the last major battle fought on British soil: a vicious confrontation between Scottish forces supporting the Stuart claim to the throne and the English Royal Army. But this wasn’t just a conflict between the Scots and the English, the battle was also part of a much larger campaign to protect the British Isles from the growing threat of a French invasion. In Trevor Royle’s vivid and evocative narrative, we are drawn into the ranks, on both sides, alongside doomed Jacobites fighting fellow Scots dressed in the red coats of the Duke of Cumberland’s Royal Army. And we meet the Duke himself, a skilled warrior who would gain notoriety due to the reprisals on Highland clans in the battle’s aftermath. Royle also takes us beyond the battle as the men of the Royal Army, galvanized by its success at Culloden, expand dramatically and start to fight campaigns overseas in America and India in order to secure British interests; we see the revolutionary use of fighting techniques first implemented at Culloden; and the creation of professional fighting forces. 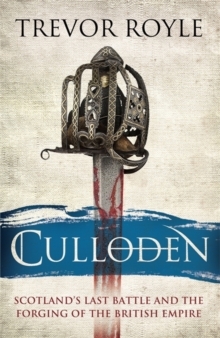 Culloden changed the course of British history by ending all hope of the Stuarts reclaiming the throne, cementing Hanoverian rule and forming the bedrock for the creation of the British Empire. Royle’s lively and provocative history looks afresh at the period and unveils its true significance, not only as the end of a struggle for the throne but the beginning of a new global power.